The ranking system of the ancient Aztecs was complex and multi layered, offering what we would consider traditional military rankings, and also having various orders and groups both inside and outside of those ranks. Traditional military hierarchies and additional orders were interwoven to create a system that offered many paths for an Aztec warrior. A large portion of rankings for Aztec warriors were based on how they performed on the battlefield, the ability for them to rise through the ranks was partially dependant on this. Nobility also played a factor too, with more opportunity afforded to the upper social layers of the Aztec society, who received superior training and greater possibility of higher ranks. The Aztec military structure as we previously mentioned mixed traditional military style rankings, and also warrior orders and classes that were grouped alongside the traditional ranks. This mix of two types of rankings in essence gave growth for the natural leaders and the Aztecs who preferred to work at grass roots levels on the battlefield. 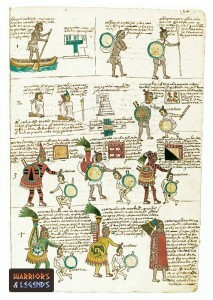 A picture from the Codex Mendoza depicting the progression of an Aztec warrior as they grow in stature based on their captives from battle. The first section we will look at is the military ranks, to look at the basic ‘officer’ structure that the Aztecs employed. It was common for these positions to be held by nobles who were afforded much more opportunity for the upper echelon of positions than the Aztec commoners. It was also common that some of the high ranking military officers in the Aztec military were priests also. A good example of this is the Tlacochcalcatl, known as the Keeper of the house of darts who was a general rank. When the Aztec youths starting training on the battlefield or in war, they were classified into certain ranks. As they progressed and proved their worth they would be able to become a youth master and later a full time warrior, once they reached manhood or made their first captive. Commoners were used in the Aztec military, to assist in battle, and to carry supplies and weapons for the rest of the troops. These assistants were known as porters, or tlamemeh. In addition to the normal Aztec priests, there were also religious priests who were also warriors. These warrior priests were known as * and had a similar ranking system to the traditional ranks. Aztec warriors were the lifeblood of the Aztec military, and there was opportunity for growth and status if they had the skill and bravery. There are many tellings of the Aztec rankings and whether they were afforded to commoners and nobles alike. One thing we are sure of is the root of progression was similar for all the warrior ranks, capture more enemies on the battlefield. The ultimate ranking for an Aztec warrior was to be a member of the prestigious ranks of the cuauhchicqueh, the Shorn Ones. Progression would not be easy though, your worth on the field of battle would be tested, your bravery questioned, and captives would have to be plenty. Ultimately life for an Aztec warrior gave them opportunity to rise, even the Aztec commoners could improve their status by proving their worth as a brave warrior in the society of the ancient Aztecs.